UK: EDF Energy Renewables (EDF ER) will source onshore towers for all its UK projects from Wind Towers Scotland, under a five-year deal. 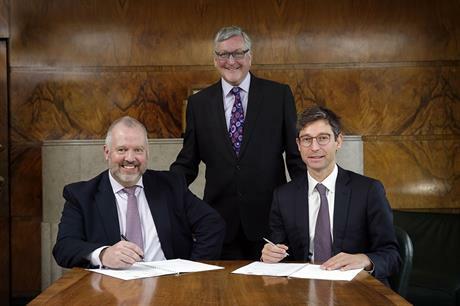 The first project to benefit from the deal will be EDF ER's 31MW Beck Burn project in Cumbria, north-west England. The project will feature nine Vestas V105-3.45MW turbines. The turbine deal was agreed last week under another master supply agreement, which covers the UK, the rest of Europe and North America. Scottish energy minister Fergus Ewing, who attended the contract signing ceremony, said: "The skills and experiences within the Scottish supply chain is something that I have been a champion of for a number of years, so the signing of this five-year agreement is excellent news and shows a real commitment by EDF ER." Alasdair Gammack, business development manager of Wind Towers Scotland, which is based on the Scottish west coast, added: "With a workforce of over 150 people and growing, and an annual wage bill in excess of £5 million, it is hard to exaggerate the importance of the wind tower factory to the Kintyre (west Scotland) economy. We applaud EDF ER's pledge to support local economic growth; this deal is a very real demonstration of that undertaking."